No Ordinary Day: Eat this! Have you ever felt a craving for something fresh and green and deliciously simple? I sometimes do. We all know we should eat a salad everyday, but do we? I don't! Which is silly considering I really love salads. And I love simple, elegant and yet surprising combinations, so this piece from the New York Times was great to read. 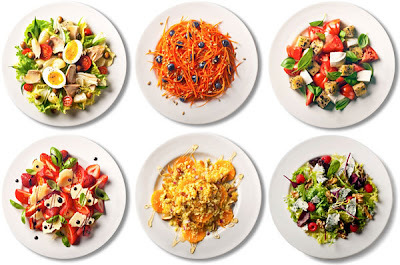 Look at this picture: Every one of those salads is making me drool! Hope you enjoy the recipes. Now excuse me while I go dig out that feta I bought the other day! YUM! Believe it or not, I like salad's too but for some reason I'm more likely to eat a salad at a restaurant than at home...not sure why. I suddenly feel too lazy to eat healthy when at home lol. I know! It's like you're allergic to anything green. And what do you mean 'too lazy'? I SERVE you your vegetables. All you have to do is put them in your mouth and chew.